AWS is a cloud computing platform which is globally available. AWS is available in 19 regions, and 57 availability zones in December 2018 and 5 more regions 15 more availability zones for 2019. An availability zone is a facility that can be somewhere in a country or in a city. Inside this facility, i.e., Data Centre, we can have multiple servers, switches, load balancing, firewalls. The things which interact with the cloud sits inside the data centers. An availability zone can be a several data centers, but if they are close together, they are counted as 1 availability zone. A region is a geographical area. Each region consists of 2 more availability zones. A region is a collection of data centers which are completely isolated from other regions. 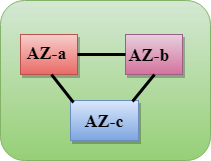 A region consists of more than two availability zones connected to each other through links. Availability zones are connected through redundant and isolated metro fibers. Edge locations are the endpoints for AWS used for caching content. Edge locations consist of CloudFront, Amazon's Content Delivery Network (CDN). Edge locations are more than regions. Currently, there are over 150 edge locations. Edge location is not a region but a small location that AWS have. It is used for caching the content. Edge locations are mainly located in most of the major cities to distribute the content to end users with reduced latency. For example, some user accesses your website from Singapore; then this request would be redirected to the edge location closest to Singapore where cached data can be read. AWS announced a new type of edge location in November 2016, known as a Regional Edge Cache. Regional Edge cache lies between CloudFront Origin servers and the edge locations. A regional edge cache has a large cache than an individual edge location. Data is removed from the cache at the edge location while the data is retained at the Regional Edge Caches. When the user requests the data, then data is no longer available at the edge location. Therefore, the edge location retrieves the cached data from the Regional edge cache instead of the Origin servers that have high latency.